Say goodbye to long lines and drab outlets -- the banks of the future are fashioning themselves into cool destinations. The interior of this ING Direct bank, in Milan, was developed by architects NewTone and mimics the design of retail stores. ING bank also partnered with design consultancy Allen International to create the first branch in Turkey without traditional tellers. The branch also features the latest "Q-matic" queuing system which allows customers to join lines remotely before they arrive at the bank. 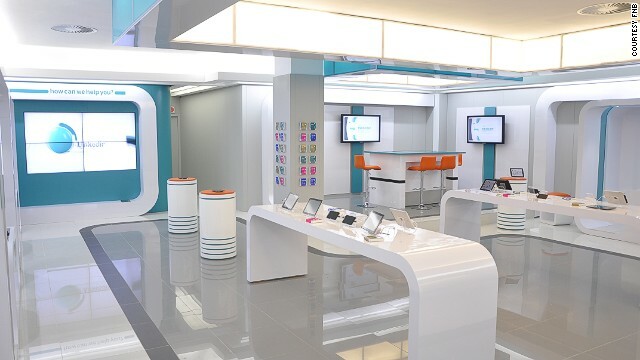 The glossy interior of the flagship Dot FNB store in Cape Town, South Africa (pictured) uses "interactive gesture technology," which detects when people pass by the store front, prompting messaging and letting customers interact with the screen to learn more about its products and services. 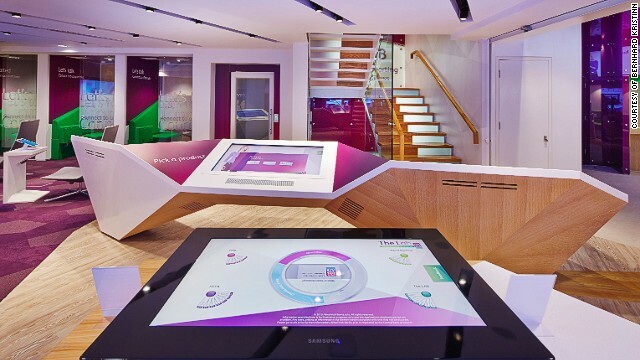 The Lab, Allied Irish Bank's digital banking store in Dublin, is centered around digital self-servicing technologies that help customers learn about its services. Visitors are offered free use of iPads, iMacs and wireless Internet. Developed by design consultancy Allen International, The Lab's quick banking zone features multi-functional ATMs and a social media wall. 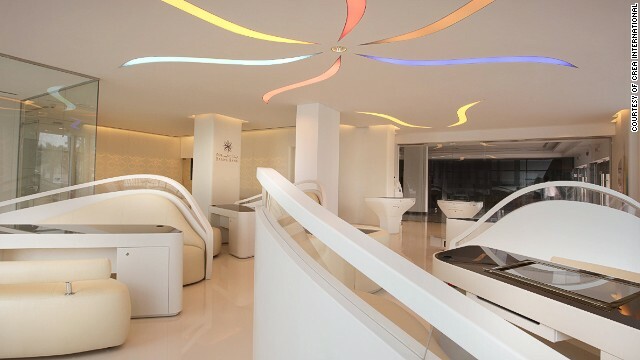 Barwa Bank in Qatar, pictured, is a design concept developed by Italian retail design company Crea International. 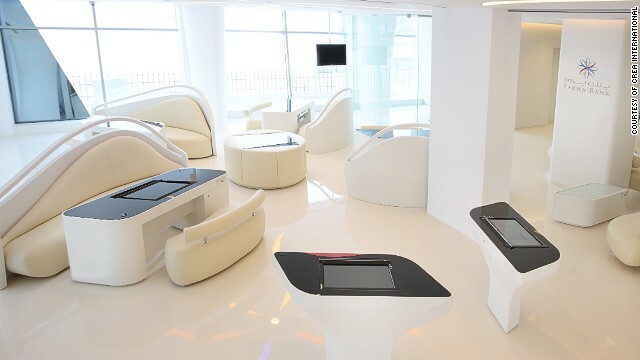 Decked with leather seats and sleek interfaces, this 'bank of the future' has a real luxury feel. Visitors to the Barwa concept branch would be welcomed by a "butler," who registers their attendance and queries. Customers are left to explore the interactive displays and various electronic devices in the meanwhile. 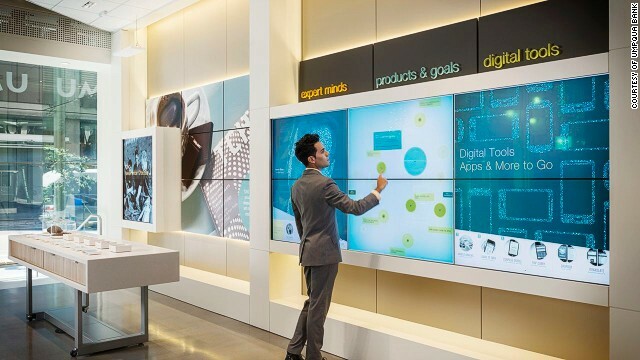 Umpqua bank has a flagship store in San Francisco that features a "Catalyst Wall" -- an interactive digital wall, where users can find out new trends and insights in the world of business. Bradesco Next, designed by YDreams, is located in Sao Paulo, Brazil. 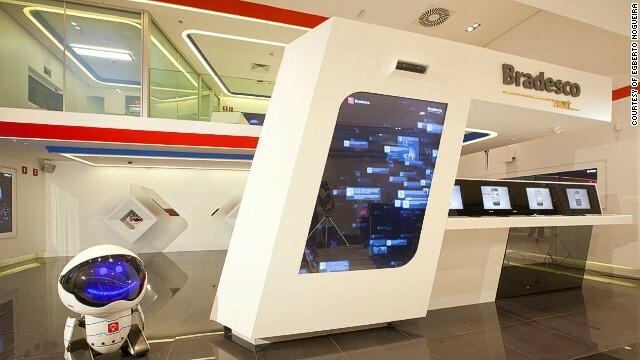 This innovative branch features multi-app walls and even houses a little robot, Link 237, who greets visitors. 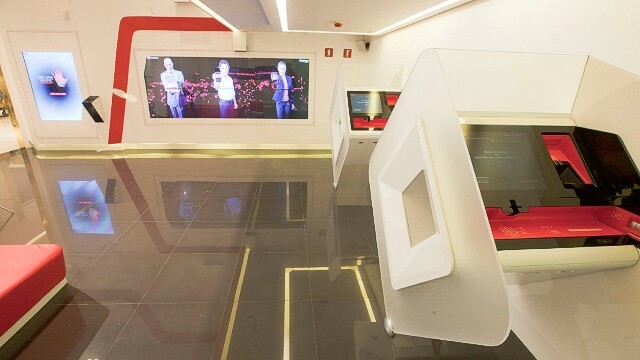 The Bradesco branch is also experimenting with touch screen technology and recognition systems that improve efficiency and security. Despite banks like Bradesco incorporating forward thinking technology, face-to-face interaction will not be overlooked. "It's about technology enabling branch employees to have higher value, personalized interactions" says Martin Shires, branch transformation manager at consumer transaction company NCR. 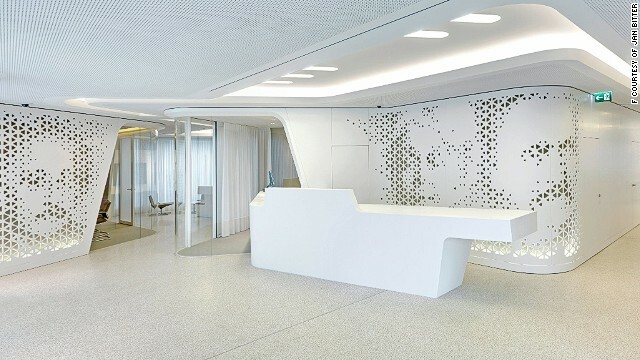 Raiffeisen's flagship bank, designed by Nau Architects and located in Zurich, features an open lounge and touch screen info table. The design strives for an atmosphere like that of a high-end retail environment. In-house systems and employee-access terminals are ingrained within the furniture. The bank also features a robotic retrieval system that allows access to safety deposit boxes at all hours. 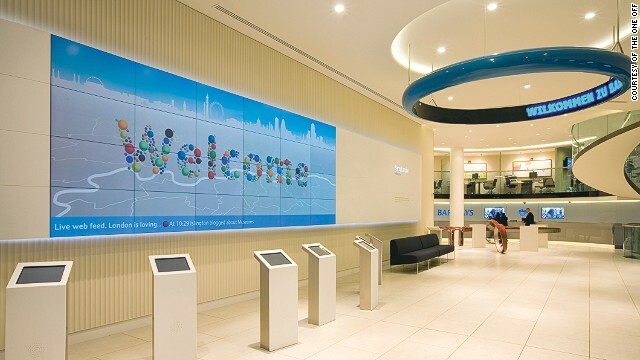 Barclays flagship branch in Piccadilly, London covers 8,000 square feet and is spread across three floors. 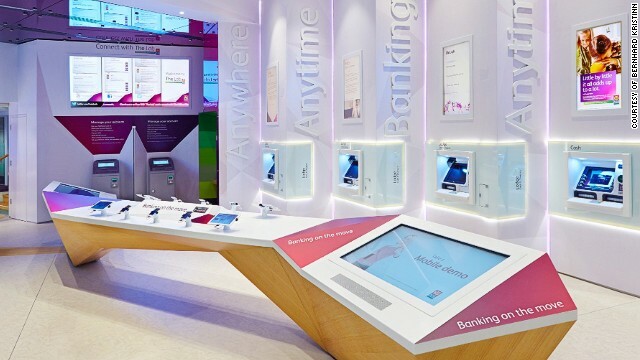 With interactivity as its focus, the bank has designated a large area to self-service banking. 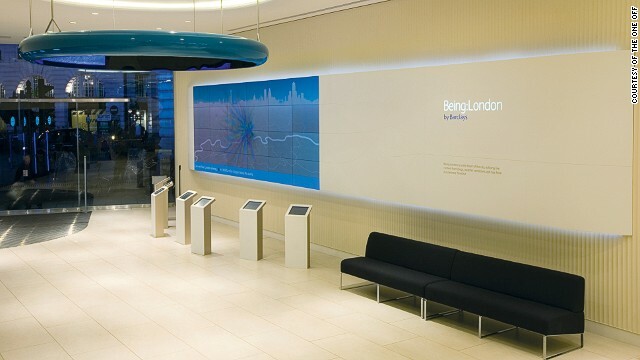 'Being: London', an interactive wall within the Piccadilly branch, provides local information and showcases what people in the capital are doing. Rather than solely driving sales, the bank also hopes to operate as a wider resource for customers and visitors. Future Finance showcases future trends related to the global financial system. (CNN) -- The checkbook is dead. While we're at it, let's write an obit for card readers too. And if you've ever worried about who might be looking over your shoulder at the ATM machine, or the exorbitant fee that money transfer will cost you, don't fret. In years to come -- not even that many -- these problems won't even exist as the way we bank and control our finances will change vastly. It already has in many ways. "We're in this unprecedented space where technology is moving so quickly it's starting to scare everyone," said Gi Fernando, founder and investor of Free:Formers, a company which helps businesses and unemployed young adults with digital training. "It's sooner than you think," said Fernando, who claims in five years from now the technology behind how we manage our banking and finances will be unrecognizable. Here are five things you most likely won't need in five years to keep your finances ticking along. 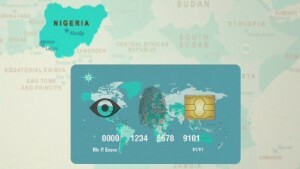 "We will see much more use of biometric data," agrees Steven Lewis, global lead banking analyst at Ernst & Young. "Fingerprints and eye scanners will replace signatures and become more prevalent," he said. "For buying stuff it's going to be pretty frictionless and seamless," said Fernando, who described a scenario whereby shoppers walk into a store, pick up what they're after, pay via their device or wearable, and walk out. 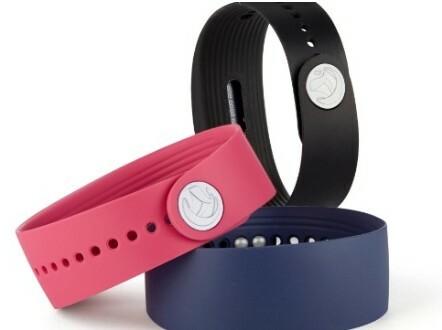 Barclaycard's bPay wristband is a wearable contactless payment device that allows users to make purchases for items costing up to £20. Though there will continue to be physical banks, many of them won't exist as we know them today. Some of them will appear in supermarkets, cafes and coffee shops, and in pop-up stores and concessions, says Fernando. Like 14th-century coffee houses in Venetian society where business deals were done, these new banking environments will serve a similar purpose. "People have a need to meet face-to-face," added Fernando. There will always be cash despite what advocates of a cashless society may predict. It's quick, easy, accepted almost anywhere and can keep your paper track simple. "Cash will take longer to die out," said Fernando. In the meantime, smartphones and contactless payment methods will grow in popularity as a way to purchase our groceries, clothes, train and bus tickets and more. The same can't be said of checks though. "Over the last few years, the check is pretty much dead," said Lewis. 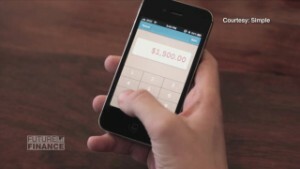 "We're using digital technology to transmit that check," he said. "We're going to have a suite of different technologies. The early adopters will be very keen to use their phones. Others will still have cash, checks and cards," added Lewis. Want to borrow money but your bank won't provide the loan? Never fear, there are many different models of peer-to-peer (P2P) lending groups and websites who will lend money directly to individuals and businesses without going through a traditional financial institution. 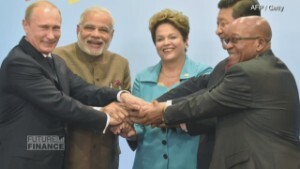 Can BRICS Bank shake up world finance? Another example -- Funding Circle, in the United Kingdom, is projecting massive growth. While banks still provide the majority of lending in the United Kingdom -- over 85% -- Funding Circle says it hopes to gain a large chunk of that market over the next five to 10 years. "We've seen significant growth amongst P2P lenders over the last couple of years," said Lewis. "Although they still represent only a tiny fraction of the overall lending market, their approach is beginning to shake up the traditional bank lending model -- so much so that some banks are starting to partner with P2P lenders to offer greater choice to customers." The days of trudging down to the bank or money transfer agent to send your hard-earned money back home or abroad may soon be over. Already there are a wide choice of companies online which offer money transfers with lower transaction fees -- Transferwise, Kantox, CurrencyFair to name a few. Azimo is growing rapidly, doubling in size every two-and-a-half months, said the company's CEO Michael Kent. "We estimate that about 98% of money transfers are still being conducted offline," said Kent, "but with the numbers moving to us we see that changing rapidly and that there will soon be a tipping point as customers realize the cost savings and benefits that digital brings." It won't be an immediate switch though, warns Lewis. "Certainly additional providers will increase competition, but we're also seeing a number of banks be more restrictive in the money transfer space as they grapple with increasingly complex and punitive anti money-laundering regulations." With cyberattacks on the rise, a modern-day challenge for financial institutions, businesses and people is to get smarter about prevention. As the UK will soon switch some of its bills to plastic bank notes, find out why they are following Canada and Australia's lead. 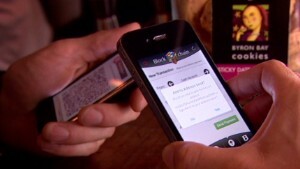 The ease of contactless cards and mobile payments has led to a rise in cashless payments. But are we nearing a cashless society? People across the world are using homegrown currencies to boost local economies -- and you can too. Four experts give their advice for running a smash hit crowdfunding campaign. Would you bank with Starbucks? In the near future, big brands could be running alternative forms of currency -- shadow economies endorsed by the consumer. Find out why Hong Kong residents don't waste time foraging for change -- for transport, shopping, groceries and coffee. Is your business a crowd pleaser? Find out why how crowdfunding will have a place in how businesses are funded in the future. Find out more about the UK's first Bitcoin ATM machine, which arrived in a trendy London cafe earlier this year. Cryptocurrencies are digital money -- and they're on the rise. 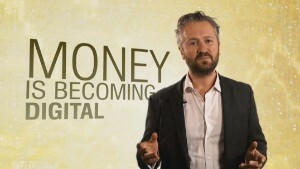 Fnd out why digital money is part of the future of finance.